It begins in 1942 as the Services Convalescent Hospital providing rehabilitation to soldiers returning from World War II. A daily programme of therapy includes exercise, counselling, recreation, occupational and physiotherapy plus balneotherapy or spa treatments. All spa treatments are at The Bathhouse in what is now the Rotorua Museum – developed as the Spa of the South Pacific by Dr Arthur Stanley Wohlmann in the early 1900’s. When The Bathhouse closes in the 1960’s, spa treatment continues in a new wing at was now known as Queen Elizabeth Hospital, specialising in treatment of Rheumatic disease. QE Health continues today as a treatment centre for people with all forms of arthritis and chronic pain. Attend one of our programmes or simply come for a “healing experience” and try one of our spa treatments, mud or beauty therapies, or use the gym while visiting Rotorua. In 1942 The New Zealand Government commissioned the Public Works Department to construct a temporary building as a convalescent depot for the repatriation of returning members of the Second New Zealand Expeditionary Force. The chosen site, north facing, on the shores of Lake Rotorua, was deemed especially suitable with clean bracing air, and proximity to water and other leisure and recreational activities necessary for successful rehabilitation. Dr Wilfred Stanley Wallis, Medical Superintendent, Dr Reeve his deputy and Matron Watt headed a staff of medical personnel, physiotherapists and occupational therapists whose aim was not only to heal, but to assist servicemen to be gradually eased into civilian life. The local Rotorua community as well was largely involved in the welfare of the patients. Hospitality was spontaneous and generous. By mid 1948 the hospital ceased to function as one solely for servicemen. Patients from Rotorua Sanatorium were transferred and the hospital now treated patients suffering from arthritis and rheumatism and allied complaints. Through Sir Bernard Freyberg, Governor General, a request was made to Buckingham Palace resulting in Queen Elizabeth (the Queen Mother) graciously consenting to the hospital being named Queen Elizabeth Hospital. Dr Wallis continued as Medical Superintendent until his retirement in 1957. In the 1960’s spa treatment was brought over to a new wing at QE Health, when the Rotorua Bathhouse (now known as the Tudor Towers) closed. After 20 years of Government administration, Queen Elizabeth Hospital was officially handed over to the Waikato Hospital Board in October 1968. Over recent years the New Zealand public health system has undergone many structural changes and QE Health’s vulnerability has often been tested. The sudden death of Medical Superintendent, Dr Irwin Isdale overseas in 1982 was one such period when for a time the hospital's future was seriously threatened. But for the vigilance and ultimate actions of staff, patients past and present and concerned organisations it is doubtful whether the hospital would have continued. Considerable pressure in support of the hospital was exerted upon the Waikato Hospital Board. Queen Elizabeth Hospital passed into private hands in 1993 and continues to provide specialised rheumatology, multidisciplinary musculoskeletal rehabilitation and arthritis surgery. Overseas visitors attend regularly to undergo a regime of thermal treatments, therapies and exercise - in short they came to "take the waters" so popular through the centuries in the European countries from where many of these people originate. In 1993 a private interest Health Group and Queen Elizabeth Community Trust combined to form QE Hospital Ltd, a private company. March 2003 saw the unveiling of a commemorative glass window funded by the Patients’ Association. This was a ‘Turn of the Century’ gift to QE Health to celebrate 60 years [1942-2002] of healing and caring. This is hanging in the main entrance. July 2003 celebrations were held to mark the tenth anniversary of the private company, and a name change to QE Health. The name change represented QE’s focus away from “illness” and more towards “wellness”. In December 2005 Queen Elizabeth Hospital Community Trust became the sole shareholder of QE Health. The Directors of the company are appointed by the Trust. 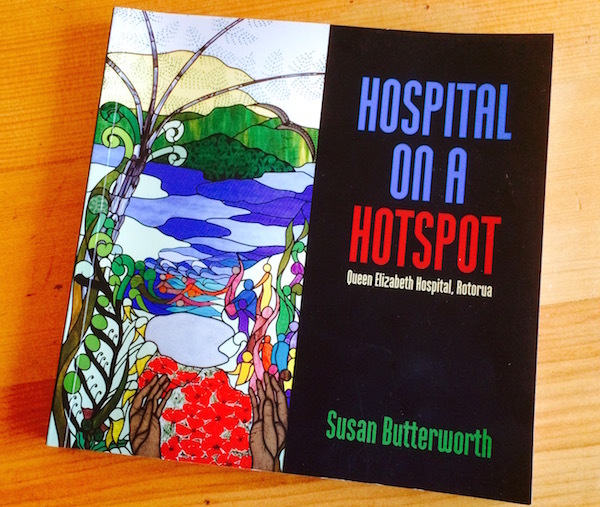 Supporters of the Trust funded the writing an production of "HOSPITAL ON A HOTSPOT"
"This warmly written, warts and all account of Rotorua's Queen Elizabeth Hospital makes a refreshing change to many pallid historical works. ... From easily accessible documents, the author has stitched all the nuggets and minutiae into a splendid whole, often drawing necessary and correct conclusions." It is available on site..